I'm against ALL zip wires in the National Park. If you want to put up zip wires... 'Zip-off' to Blackpool to the theme park!!! 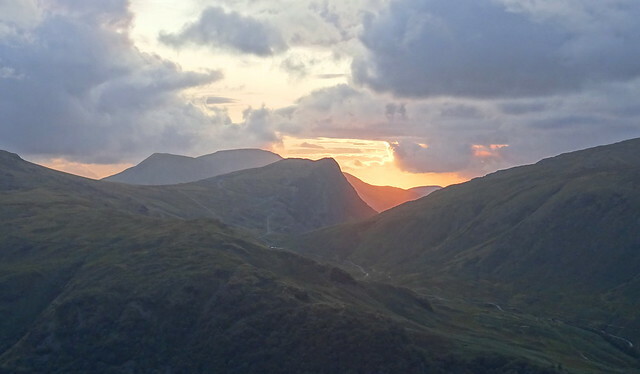 Fleetwith Pike and Honister Crag is seen in the centre of the shot. The zip wire would go across the side of Honister Crag. I still can't see how some people think this would ok here but not at Thirlmere. Please post a response if you are of that opinion, I just want to understand why. The ugly scar from the quarry is on the other side of the fell so you can't say it is because it is in a quarry? I have had a hunt on line and can find nothing. Does anyone else know of any quarry in the world that uses a zip wire for moving stone? If you look at the application that is the first purpose listed and the major difference between this application and Thirlmere. The Friends of the Lake District are going to object to the zip wire proposal at Honister. Good for them to stick to their principles I agree with them about the numbers of people using the shorter, lower down zip wire seems to uncertain/unknown. Surely the LDNP will need that clarified before they can make a decision? Not that I'm in favour of the zip wire going in at Honister, but there was an aerial pulley system, called the Lancaster Aerial, in use at Honister. It was used to take slabs of slate down to the mine building for processing. Apparently it was removed in the 1950s. I have also concluded that this is not a development which should be allowed in the National Park. I think the plan is less bad than Thirlmere only on the grounds that the only people able to use the wire, or top section of it anyway, are those who have already completed the via ferrata. On the question of whether this is the type of development which should be set in the fells - I cannot think it is desirable. Lakeland Lorry's link is really interesting, but one thing it does show is that, while this type of development was there in the past, it has been removed - and I think most would agree that the fellside is a better place without it. It seems to me to be a retrograde step to reinstate it. I find it hard to believe that there is no other economic system to move the rock down to the hause, though I accept that my engineering knowledge runs to the easier end of the lego scale. However, I suspect that this application is more likely to succeed than the Turnip Plantation scheme at Thirlmere - for the reasons that there is already a quarry there, that there is already a via ferrata there and, therefore, the impact of the wire will be argued to be less severe than was the case at Thirlmere. I hope I am wrong - and I have written my email of opposition. my engineering knowledge runs to the easier end of the lego scale. If this does get approved at least the top zippers will have to climb up the via ferrata, put some effort in to earn the right to use the zip wire. I still oppose the plan, for me it just isn't right to have this playground ride on a fell side, quarry there or not. I just think the Coniston area would be next, the Coppermines valley would be high up on someone's list of where they could put a zip wire in a quarry in the Lakes that might get approval. I'm surprised that Clive Hutchby is supporting it, he is the man updating the Wainwrights I'll add these new guides to my banned list, I won't give my money or custom to anyone who supports these zip wires, they are just wrong IMO. The Wainwright Society has objected to the zip wire, see below. The title at the top of the article has an error in it, mentioning Thirlmere, it should say Honister. Thanks for the updates April. Interestingly CWT have objected on the basis of the lack of an Appropriate Assessment and that they didn't object to Thirlmere. I think the earlier comments are being borne out here, there just seems to be less of an all round anti feeling about this application than there was at Thirlmere. there just seems to be less of an all round anti feeling about this application than there was at Thirlmere. I just can't understand why The zip wire at Honister would have the same negative impact as the Thirlmere zip wires. The Friends of the Lake District full response to LDNPA is now available to look at on the Aerial Flight at Honister tab. Excellent work from Laura Fiske again. To those who were against Thirlmere but support Honister, perhaps you should read this response and have another think about it. Great letter from Laura Fiske - she has done a good job of going through the application step by step. That should be required reading. Thanks for posting, April. I took a long time looking across from High Snock Rigg on Sunday at Honister Crags and I'm glad I did - there really is no positive side to this proposal - it has no place in this environment! I realised from reading Laura's letter that the zip wire starting point is the same as it was in the last refused application. I thought the start of the wire was proposed to be on the top of Black Star in that last application. Looking at the past plans on LDNP website, it was the first application where the zip wire was planned to start from the top of Black Star. So this is bad news that my memory isn't very good but good news that the zip wire was refused the last time, the proposal hasn't changed that much. It is a very well written document. My hope is that it will also be rejected, which as it was thrown out before it should be, and then people will get the hint that this type of development will never be given the green light.